Transparent removable top with headliner, Vararam ram air intake, MGW short throw shifter, Magnaflow exhaust with x-pipe,Speed Lingerie color matched bra, HUD, nav system, 3LT luxury and Z51 performance packages, fuel rail covers match ext. color, seq.turn signals, Lloyds cargo & floor mats, windshield shade, custom console cover & travel pouch, cargo shade and net, under hood lamp,trunk apron, Window sticker, build sheet, & dyno sheet, full set C6 manuals, Have all original parts. Beautiful, one owner, loaded, Corvette. FOR SALE. 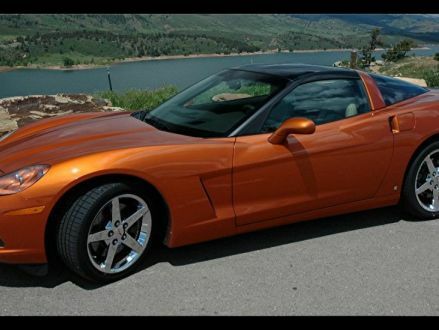 This is a Atomic Orange Metallic 2007 Chevrolet Corvette C6 Corvette with Cashmere interior, Manual transmission, Rear-Wheel Drive, and a 8-Cyl. engine. It's in Excellent condition, with 76,000 miles, and located in Laramie, WY.